Remember that all promises invariably can and will be broken. Especially if I, the promisor, am literally broken. The following is a ludicrously sad tale of bad luck, followed by more bad luck, spiraling into bizarro bad luck and ending in an extremely and profoundly fall from grace. Therefore I beg your forgiveness, as I promised to visit with you each and every week. I failed. I broke a promise, but more than a promise was broken. Stick with me. This is worth the read. Worth your time. As I, your Yard Yeti Garden blogger have only recently rehabbed sufficiently to be able to sit in front of my computer for more than 10 minutes without screaming. You all have similar stories. I know because you told me many times over the years. We are one and the same. Our paths cross across oceans and continents. We are never truly alone, as we have…each other. The Global Yard Yeti community always have each other’s backs. And man, do I need you to have mine. Maybe not. Read and then you decide. My story begins with a new kitchen faucet. Installed by my plumber friend of 25 years. An honest and decent man. It is 11PM on a Wednesday night. I am reading quietly, under the ever present line up of twinkling stars outside my window. Bam! A loud explosion in the kitchen. I run and rip one the cabinet doors under the kitchen sink and am covered head to foot in a whoosh of water. In seconds the water piles up two inches deep on the floor beneath my feet. I scream SHUT OFF THE WATER MAIN. Over and over. However, my old man who never believes in anything until he can see it for himself, starts up the stairs where I meet him and scream into his face. Together we assess the damage. Two inches of water in the kitchen and two more in the basement below. We mop, we wring, dry and set out fans. Ha! Little do we know. A call to our plumber, a sleepless night and in the AM the gathering of clouds, the barometer falling, the rise of the tides and our home, our ship at sea begins to sink. 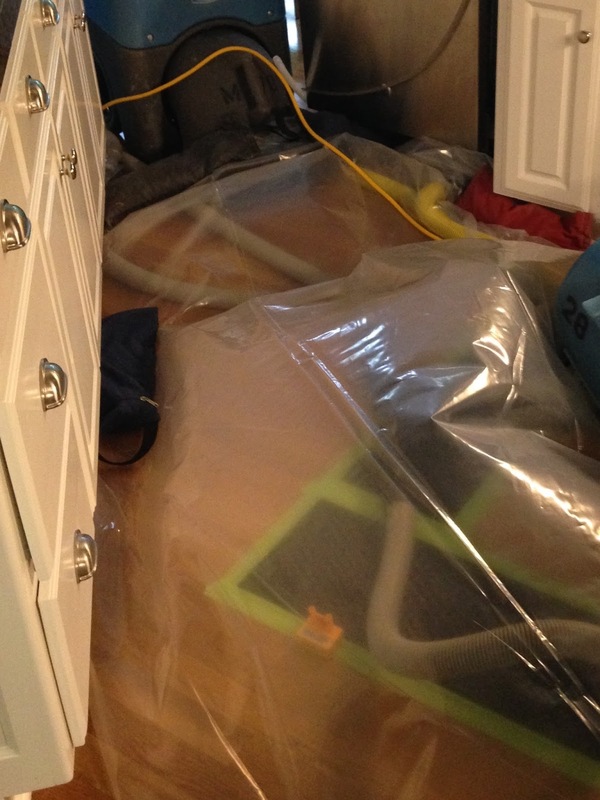 A team of experts schooled in water damage restorations arrives at dawn bearing gifts. 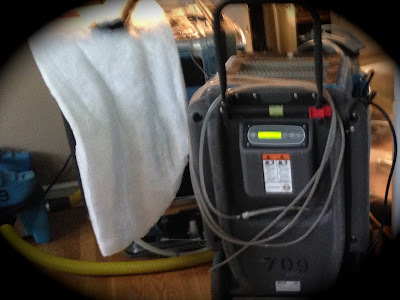 Large, make that HUGE generators, humidifiers, fans, an array of sneaky snaky hoses inserted into ripped off baseboards. I think to myself. Rescue. The Mounties are here. All will be well. Until they flip all the switches and the engines come to life. I am now standing on the tarmac at O”Hare Airport behind a revving jet engine without protective headphones. The noise is so intense, so pervasive that we find solace only in a tiny corner of our basement. Because what is happening upstairs is duplicated down here too. Four days they say. Four days of sudden onset vibrating vertigo inducing deafness. They offer us a motel. We decline. This lack of action to move is the ONLY lucky break in the next month and more. Why? You ask why? At 4 AM, my wary old man on the prowl unable to sleep from the noise, checks out the kitchen only to find that the Super Dry Super Guys forgot to cap the dishwasher during the decibel loading phase and we now have 5 MORE INCHES of water on the kitchen floor, draining through the walls down to basement and into the office and study. The carpet is floating away from the wall, water is dripping from the smoke detector in the ceiling, brown ugly stains streaming down walls and the hallway. In the AM more generators, hoses, tubing, snaky tubes and 4 MORE DAYS added to the first FOUR DAYS. A new nightmare. Afraid to turn on anything water related, we are trapped. We dare not leave. There are storms on the horizon…literally. A side note to the Perfect Storm tale. A Perfect Storm requires triangulation. A minor blip meeting another minor blip and another that results into an epic merging of forces. The Storm is forming on the horizon. We just cannot see it yet, as we are monitoring and managing our encroaching insanity. The next rising tide. Our landscape debacle. A job of 3 days now 3 WEEKS in. A job that started, stopped and sputtered. Wrong plants. No crew. Wrong crew. No plants. Watching and waiting out serious ineptitude. And now we have fountain features INSIDE our house that would have been so much nicer OUTSIDE. Holes in the house, unfilled holes in the yard and nowhere to run. Perfect Storms tend to build and fester and peak when we have lost control to Mother Nature. So it is OUTSIDE that I lose my grip on my last nerve as I wave goodbye to the Three Stooges Landscape Crew, Moe Larry and Curly. Two pots. Two 40 lb. pots I have longed to set out in front, are at my feet. Well they were 40 lbs. BEFORE my husband watered them without telling me. My nerve snaps first as I grab the pots and race up the hill. Something else snaps. My back. Two days later I am in Urgent Care barely able to move. Ear spasms and lower back spasms. Muscle relaxants make me hallucinate that I am healed, until I MOVE. Next stop. PT. Three weeks of knock your socks off stretches and electrical stimulation of back muscles, because there is not enough electrical stimulation in my HOUSE. The Light House. I see the beam. Hope on the horizon. A light to guide me home. Ah no. That would be LIGHTNING. No light to guide me home. In point of fact, no light at all! I fumble in the dark, holding my back while searching for batteries that we forgot to replace. I sit in the dark and listen to my husband snoring a room away. I, however, am vigilant. the PERFECTLY PERFECT storm is lurking. Waiting to finish me off. Water outside. Water Inside. Blessing? The drying machines are as powerless as I. So we all sit in silence for the next 5 hours. I doze until I hear a whisper in my ear. We are not done with you yet. In the AM, power restored, I pile the wet towels from the sop sop sop clean up, into the washing machine, while wearing my noise cancelling headphones. This new NOISE defies cancelling. Metal on metal grinding and the rinse cycle is perseverating on rinse. Transitioning to fill fill fill fill. The machine is stuck on stupid. More. More. Water. An hour later after an hour of bailing at sea, confirmation. The washing machine no longer washes. It simply loves water too much to release it. Washer repairman called. Ah! A simple solution. A dime. A dime stuck in the washer gizmo. A dime from the pocket of Poppa’s golf shorts. The same man who stands before me, dime in hand and smiles. I cannot repeat what I said to him in private. Nor can I describe my inordinate fear, my anxious anxiety as I pass any appliance, faucet, sprinkler system, hose, or water related machinery. I cannot allow the dishwasher to run when I am in the building. I cower in the shower. I shrink from the hose. I am vulnerable and the Perfect Storm knows it. Seek and ye shall find. And the storm did. Find me. As I stood to put my phone away, I rose from my chair, grabbed the aching muscle in my back, reached out to steady myself with one hand on the end table, only to END UP on the floor. Down. The Titanic is going down.